Volvo’s VN lineup was already pretty versatile, but the company has also introduced a natural gas-powered version of the truck at Mid-America Trucking Show in Louisville. Compared to the diesel models, the new CNG version doesn’t have any exterior or interior modifications and shares the same features as its siblings. 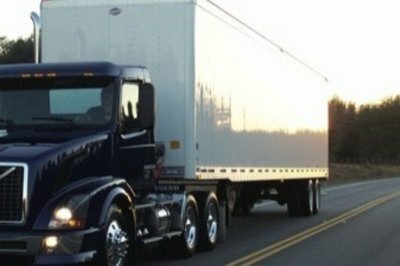 The natural gas-powered trucks represent a very efficient option for fleet owners and truckers who want to lower the fuel costs and this technology has already started to be seen with very good eyes in the commercial vehicles segment. The natural gas powered Volvo VNL Daycab has a typical heavy duty appearance with an aerodynamic design and an imposing stance. 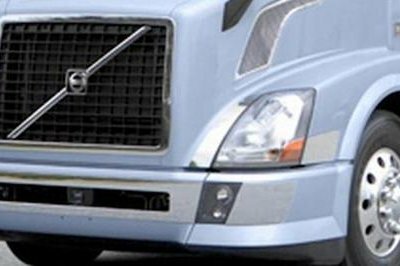 The long nose is dominated by a huge rectangular grille which is traversed by the typical Volvo diagonal grille underlining the rugged nature of the truck. The grille is flanked by the similarly big headlights which are mounted on the oversized wheel arches, further enhancing the purposeful look of the vehicle. Volvo says that its VNL Day cab model has the lowest drag coefficient that can be found on any truck from the road and judging by its slippery shape of we tend to believe them. To achieve such a high level of aerodynamic performances the truck was designed with a heavily sloped hood and wedge-shaped headlights which were designed to cut effortlessly through the air. Moreover, Volvo has also minimized the gap between cab and trailer for less air turbulence and drag. Grasp the grabs, put your foot on the bottom step and pull yourself up to the opening. Once inside you’ll find acres of space and the superior build quality which made Volvo famous for its well finished cabins. Cab doors are double sealed to keep out water, wind and noise, while a sophisticated air filtration system keeps the cabin free of dust. There’s extra room between the seats, and plenty of storage space on the back wall and overhead. Needless to say that the sound isolation is among the best in the segment keeping the cab quiet and the cruise relaxing. For adequate comfort, the cabin is also fitted a capable climate control system which maintains a proper temperature in the cab. The ergonomic dashboard is slightly angled towards the driver and features a centrally positioned screen which displays all key diagnostic information. The tilt steering wheel and telescopic steering column can be adjusted in any way you wish, while it can also be moved up and out of the way for easy entry and exit. The ergonomic steering wheel design offers a better control and also accommodates a standard airbag. Volvo’s seats are among the best in the business and they offer a high level of comfort and good back and lateral support. There are numerous versions of seats available and the standard Level provides contoured cushions, 7" fore-and-aft slide, front cushion adjustment, power air lumbar and rear cushion adjustment. The Comfort Level includes standard features plus additional shoulder support, contoured side bolsters, power air cushion and back bolsters, triple chamber lumbar support and six-button seat. Moreover, the Comfort Level Additional options include swivel base, heated cushions, BackCycler and Wide-Plus cushions that are 2" wider than a standard-width seat. 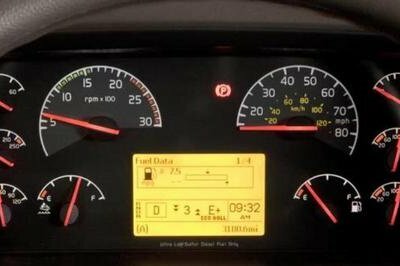 The central instrument display is easy to read and supports the Volvo Link interface. The display functions can be controlled by means of the stalks mounted on the steering wheel which permit you full access. You won’t have any complains about the rest of the controls and switches either, as they have a logical layout and are within easy reach, making them easy to use even while driving. For more convenience, the most-often-used switches are located on the multifunctional steering wheel, while the controls for electric mirror adjustment, power windows and power door locks located within easy reach on top of the door panel. The natural gas-powered Volvo VNL is equipped with a 12-liter, 400 horsepower, 1,450 lb-ft. torque Cummins Westport ISX12 G engine that uses cost-effective, clean-burning compressed or liquefied natural gas and requires only a three-way catalyst to meet EPA 2010 emissions standards. The 12-liter engine is mated on Volvo’s 12 speed I-Shift automated mechanical transmission that maximizes driver comfort, payload and fuel economy. For enhanced driving comfort there’s no clutch pedal, and the gearshift is operated by a host of electronics. I-Shift automatically selects the best gear for the engine in order to extract maximum power with minimum fuel consumption. The natural gas-powered Volvo VNL Daycab offers customers a larger – 123-inch bumper-to-back-of-cab (BBC) and is rated up to 80,000 lbs. GCWR – and more robust spec than the natural-gas powered Volvo VNM daycab. Introduced in 2011, the VNM Daycab features a 113-inch BBC and is rated up to 66,000 lbs. GCWR. The natural gas-powered Volvo VNL Daycab is equipped with a standard air suspension which offers a fairly comfortable and stabile ride. The suspension soaks every road bump and you’ll fell as new even after a full day of work. Furthermore, Rear cab suspension air bags are mounted outside the frame rails for greater cab stability when cornering while lateral shock absorbers reduce swaying of the cab. 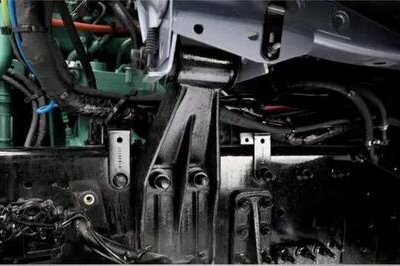 There are also hardened rubber dampeners in the suspension system which help to absorb the impact of a severe shock to the cab. 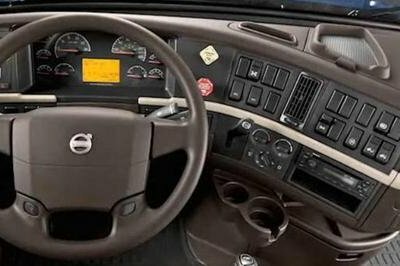 The Volvo VNL was already known as a capable and efficient truck, with a strong build quality and a healthy reliability. The cabin is among the best kitted in the segment, while the overall ergonomy is also part of the high class. The addition of the natural-powered version is welcomed and even if this technology won’t offer the same lively performances as a conventional fuel engine, the truck still has a maximum GCWR of 80,000 lbs which is impressive. The natural gas-powered Volvo VNL Daycab will be an optimal choice for regional transport, intermodal distribution, fuel distribution or even pickup and delivery. Volvo is currently operating natural gas-powered VNL demonstrator trucks, with production beginning in conjunction with commercial availability of the 12-liter gas engine.